2/3 cup Almonds (or cashews) - high in protein and complex carbs! 1 cup dried apricots - high in beta carotene! 1 cup shredded coconut (sweetened or unsweetened) - YUMMY! 1/3 cup thick rolled oats - high in cholesterol lowering beta glucan fiber! 3 tablespoons EV coconut oil, melted - anti-inflammatory healthy fat! 1/4 cup ground flax seeds - high in lignan fiber and Omega-3’s! 1/2 teaspoon ground ginger (optional) - very anti-inflammatory! 1/2 teaspoon sea salt - provides vital minerals! A few drops each of Lemon & Citrus Fresh Essential Oils. Line a 8 inch baking pan with wax paper, set aside. Place nuts in a food processor and process until evenly chopped, set aside. Put dried apricots in the food processor and process for 3-4 minutes to finely chop. Add coconut, oats, coconut oil, flax seeds, ginger and sea salt. Process until mixture comes together. Add the chopped nuts and pulse until well combined. This is when I taste it to see how much stevia I want to add. Put some of the mixture in your palm and squeeze together to see how well it holds together. If it falls apart, add one or two tablespoons of water. 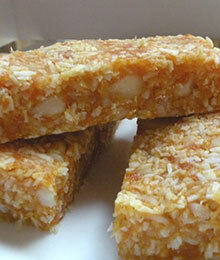 Put the apricot coconut mixture in the parchment lined baking pan and firmly press into pan. Cover the bars and place in a freezer for one hour. Unmold and cut into bars. Bars will last up to one month if stored in an air tight container in the fridge or freezer. I like to wrap them individually in sticky wrap and store in the freezer. Great for travel and take to work or play!